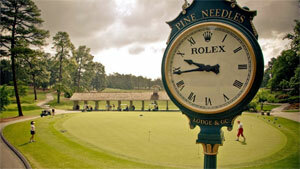 Designed in 1927, Pine Needles offers the opportunity to play golf the way it was meant to be played. The traditional Donald Ross course meanders through the rolling hills and longleaf pines of the Sandhills area. This peaceful setting still challenges golfers of all skill levels. Both Pine Needles and Mid Pines, our sister property, permit and encourage walking year round. Complimenting the course are the extensive practice facilities and 4-Hole Practice Loop.